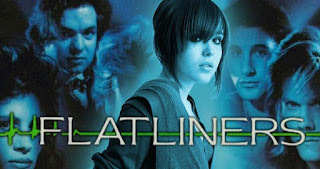 In 1990 Flatliners brought together a Brat Pack group of rising stars who played medical students testing the divide between life and death by purposely stopping their hearts and then being revived. Soon they discover that each has a darkness tagging along on the journey back to the living. Flash forward to 2017 and you have a sequel of sorts with some new students trying the same risky and questionable endeavor. This new group is made of Courtney (Ellen Page), Ray (Diego Luna), Marlo (Nina Dobrev), Jamie (James Norton) and Sophia (Kiersey Clemons). They are a usual mix of the types you would see on any pre packaged ER rip off. You know - belabored, stressed but young enough to still be brilliant and full of sexual tension. Courtney arranges an odd sort of surprise party and invites Jamie and Sophia to join her in the basement of the hospital where they all work. Once there she unveils her real plans - "Surprise, we're going to render me effectively dead and hope you can bring me back before I turn into a vegetable. Sounds like fun, right?" It turns out because of a tragic loss in her earlier life, Courtney is obsessed with near death experiences. With a little bit too little persuasion, Jamie and Sophia are on board. It doesn't go exactly as planned and Ray and Marlo get dragged into it all to save the day. Courtney's experience while scary, has a big impact and gives her a new lease on life (so to speak). The others, except for Ray, all fall in line and have their own flatline experience. Soon it's obvious that there are side effects as scary as any you might hear on a cheerful drug commercial. Mainly dark secrets from the past have followed them back from the other side and the consequences can be deadly. It pains me to say but this flick is fairly redundant and wastes so many opportunities. Think about it. The premise is so intriguing. 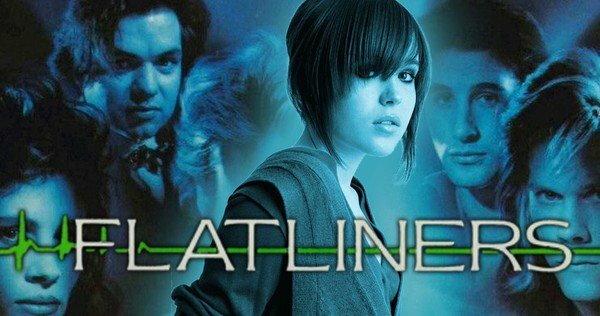 A completely dark, edgy, surreal tone could have permeated Flatliners. Instead, it plays out beat for beat almost like the original which was perfectly decent but a bit bland. I generally like all of the actors especially Ellen Page and Diego Luna. The Vampire Diaries was a guilty pleasure for years that filled a Buffy shaped hole in my heart; so I'm sort of a fan of Nina Dobrev. However not a one of them had any real meat in the script to work with. A C effort at best and you should not feel any guilt if you happen to stop and take a look when flipping through your basic cable channels.